[Stride]-Stride Step-[Choose one or more cards with the sum of their grades being 3 or greater from your hand, and discard them] Stride this card on your (VC) from face down. [AUTO]:[Choose four other face up from your G zone, and turn them face down] When this unit is put into your G zone from (VC), you may pay the cost. If you do, you get an additional turn. Skip the ride phase of that additional turn, and at the beginning of the main phase, Stride this card on your (VC). A rather slow finisher, but a reasonably solid one. You need 4 ZTBs face-up in the G Zone, so you’re looking to drop this at third Stride since I doubt you’ll spam Gear Groovy just to rush to this anymore. If you live to that point though, for the price of resetting your previous Strides you get what is essentially a +4 in hard advantage to yourself with another Triple Drive and a Draw Phase, not to mention the extra attacks you get in bypassing Gredora, and non-Omega Locks. Also comes with all the drawbacks of moving to another turn, such as not allowing triggers to carry over, but in all fairness it just means the opponent’s damage checks don’t carry over either. Slow, but odds are you’ll win on Gearnext or failing that, this is the more assured killer. You don’t need any more than 1 copy. What’s up, Rogue Squad?! Today’s card, in short, has seen a nice amount of controversy when it was first revealed, and some people still aren’t fans of being in the receiving end of this but for good reason. Heritage is a very good card that is a hard answer to its bane control matchups (namely Gredora and Chaos Breaker) as getting you a free turn will get around your call prohibitions or locks, let you reformat your board in case you have to, and net you extra pluses through the draw phase and drive checks alone, and that’s not including any other skills you could activate during that turn, like Cruising Dragon or your Unicorn. 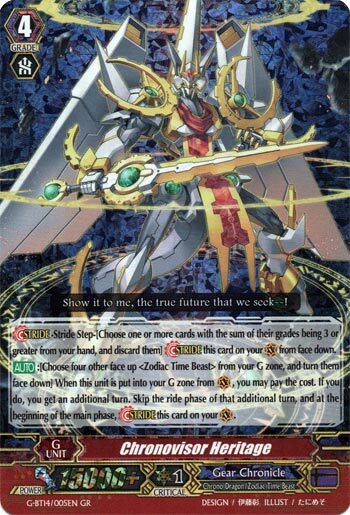 The only real “drawback” is that you need at least 4 ZTB G Units faceup to activate his skill, this making him a third Stride (second if you use Split Pegasus and two of the new ZTG G Guardian), but the cost of sending them back face down to the G Deck makes it so that you can 1.) Reuse the G units that you flipped back down and 2.) Reset your G Guardian count in case you’d need to use them again. It’s a bit on the slow side, but the consequences for pulling him off are game changing and will tilt the game easily to your advantage if you don’t kill them that turn. Considering it’s slow setup, you only really need one of him, but one is more than enough for you to need. Next Time: You must construct additional pylo-…erm…Guardians.